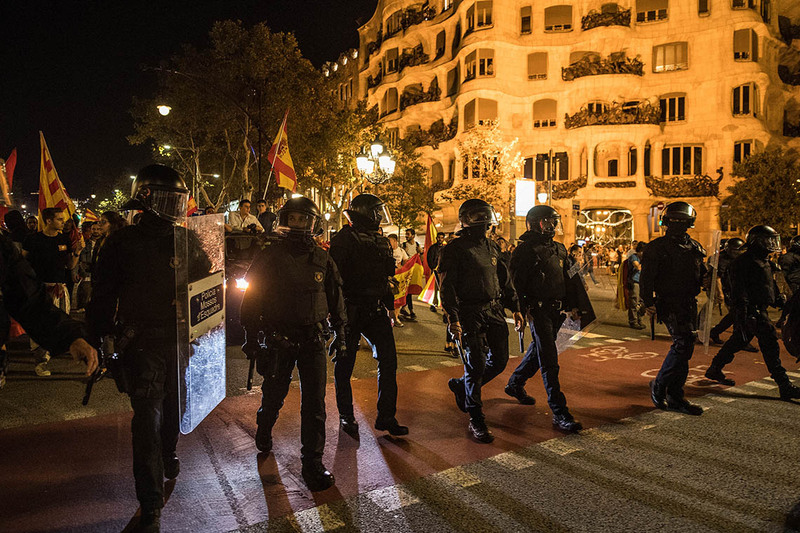 The political crisis between Spain and Catalonia intensified Friday as Madrid imposed direct rule, dissolved the Catalan parliament and announced new elections after the secessionist region voted to establish an independent republic. With the vote, what can we expect now? Spain has threatened to take control. Does that mean the army comes in? Are you worried about violence? The Catalan regional parliament approved a declaration of independence this afternoon with 70 votes out of a total of 135 votes. Almost half of the representatives left the chamber in protest before the vote. Immediately after this vote, the Spanish Senate approved Article 155 of the Spanish constitution that gives the government powers to impose direct rule on any autonomous community that breaches the obligations of the constitution. In the application of Article 155, Spain’s Prime Minister Mariano Rajoy has asked for the dissolution of the Catalan regional parliament, the dismissal of the Catalan government and Catalan regional elections within a period of six months. The government of Spain will thus take control of the region of Catalonia in the coming days, and it is unlikely that this process will go smoothly. There will be resistance from Catalan government officials and from a portion of the highly mobilized Catalan population that is in favour of independence. It is not difficult to imagine how this might lead to the use of actual force by the Spanish government as well as to clashes among a very divided Catalan population. The situation is worrisome and insofar as it is completely unprecedented, it is hard to predict the next developments. It is also important to consider whether new regional elections will solve the current impasse. On the one hand, it is unclear whether elections would yield a different (non-secessionist) political majority that could break the gridlock. On the other hand, there is a possibility that these elections are boycotted by secessionist parties in which case they would lose all legitimacy. In sum, the current conflict is far from being resolved. Could this situation have been avoided? The Catalan government had asked for negotiations after the referendum. Would negotiations help? During the past weeks both Rajoy and Catalan [regional] leader Carles Puigdemont have chosen to listen to their parochial electoral majorities instead of trying to find common ground among more moderate sensibilities. This has led to maximalist positions on both sides and many missed opportunities to find a solution to this conflict. Puigdemont’s offer of negotiation has always been more symbolic than real. He has reiterated the will to negotiate the terms of Catalan independence knowing that the Spanish state would never accept independence as the starting point of a negotiation. Rajoy, on his part, has adopted a very unproductive legalistic approach to the situation instead of opening up a dialogue about reforming the Spanish constitution or defining the terms of a new referendum. On Thursday, Puigdemont made a move that could be considered conciliatory: He considered calling early regional elections. But then he backtracked for two reasons. First, because of pressures from his extremist flank (pro-secessionists in his coalition threatened to leave the coalition if he called early elections). Second, Puigdemont did not get a straight answer from Rajoy that he would not proceed with Article 155 and the suspension of autonomy even if Puigdemont called for early elections. Rajoy could have offered Puigdemont those guarantees, but he did not. In doing so, Rajoy missed another opportunity to de-escalate the conflict. And now we find ourselves in the worst possible scenario – a declaration of independence that is not going to be internationally recognized and that does not have the support of a solid majority of Catalans. And an unprecedented suspension of direct rule in Spain. If Catalonia really does separate, can it remain independent for long? The only way to be a viable independent state in the current international system is to be recognized as such by other states. It is unlikely that a majority of states will recognize this declaration of independence, and more importantly neither Spain nor the EU will recognize it. The Spanish Constitutional Court is likely to strike down the declaration of independence in a matter of days, and EU President Donald Tusk just said that their sole interlocutor is Spain.